Data is the new currency. That’s just as true in pharma as anywhere else, particularly as the space is increasingly interested in value-based contracts. And innovation requires collaboration across payers, providers and pharma for evidence-driven outcomes. 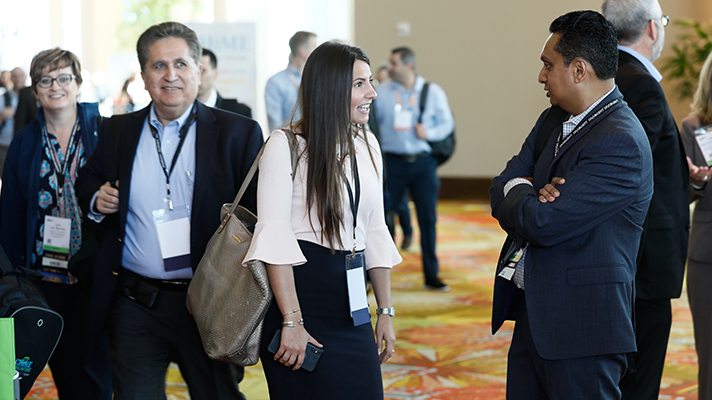 These were the top takeaways at the Pharma Forum, which occurred at HIMSS19 during February. Experts speaking at the inaugural event, which drew more than 225 attendees, also addressed the biggest challenges ahead. Let’s take a look at the Pharma Forum highlights. 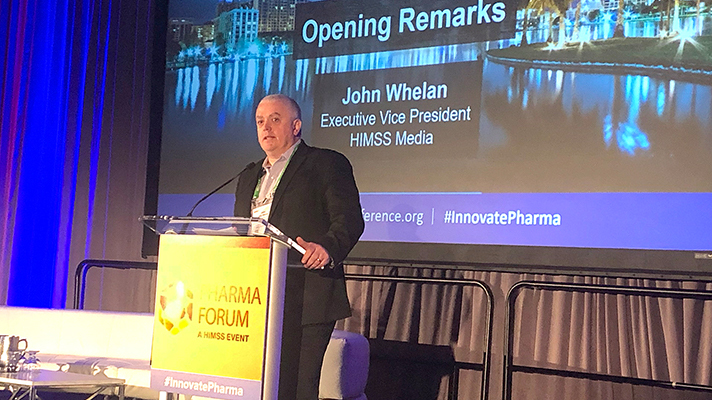 HIMSS Media Executive Vice President John Whelan kicking off the Pharma Forum at HIMSS19. To be effective, data can’t belong to just one group, according to Pfizer executive Christopher Boone. Collaboration is needed to get to evidence-driven outcomes. This gets into discussions around precision medicine and better engagement with the patient, provider and payer community, he said. There is a need for all stakeholders to use the same evidence across the board, Boone said. The biggest data challenge is measuring patient outcomes, followed by regulatory, legal and compliance issues, according to Jeffrey Morgan, managing director, Life Sciences, Deloitte Consulting. Atrium Health Chief Strategy Officer Dr. Rasu Shrestha added during the Pharma Forum that “data is screaming at us. That gets to the top of the pyramid,” which is wisdom. Sometimes the data needed doesn’t yet exist, because the outcomes the pharmaceutical industry wants to measure are not captured in medical records or claims, Morgan said. “There’s been an uptick in such value-based programs since 2013, but hurdles still exist in legal and compliance considerations and regulatory barriers that make it challenging to collect and link data,” Morgan said. In specific areas, there are collaborations to study medication effectiveness. There is experimentation in the areas of oncology, chronic conditions such as diabetes and cardiovascular disease, inflammatory disease and Hepatitis C.
Pharmaceutical companies work with patients and populations of certain disease groups to make sure medicines are being used correctly, according to Shelley Price, director Payer and Life Sciences for HIMSS. “As our U.S. based ecosystem is changing toward value-based care, pharma is rightfully getting into that space,” Price said. But though there are universal challenges to connectivity, pharma as an industry is a very broad, she said. There are the top 10 global pharma companies, the mid-sized firms, the innovators and the biotechs. Their businesses and needs are very diverse. Some of the new gene therapies are looking at value-based collaboration as a vehicle, Morgan said. It was telling, Morgan said, that in February when seven big pharma executives sat before the Senate Committee on Finance to face questions about high drug prices, five said value-based contracting is part of the solution. 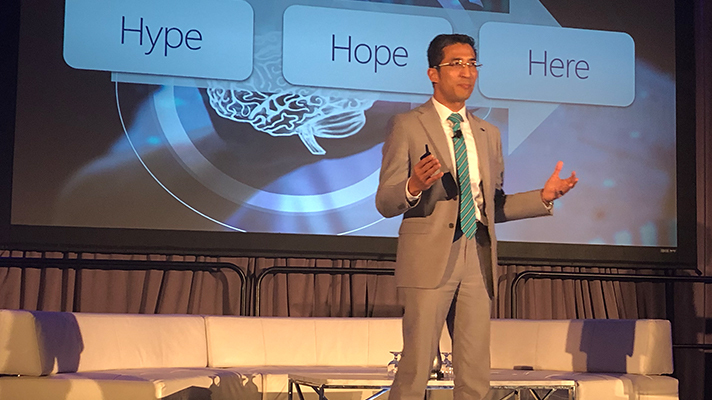 Atrium Health Chief Strategy Officer Dr. Rasu Shrestha said “data is screaming at us,” at the Pharma Forum. As of today, the pharmaceutical industry is not yet at scale across diseases and drugs. To reach that will require dedicated teams that aggregate and analyze data and that will inevitably raise the big question about who pays for these resources, Morgan said. Value-based contracts are more prevalent outside of the United States. In the U.S., they are increasing as the price of breakthrough therapies continues to rise and the cost of developing these drugs is unsustainable, Morgan said. The 21st Century Cures Act, passed in 2016, places additional focus on the use of of data to support regulatory decision-making, including approval of new indications for approved drugs. In addition, FDA guidance in June 2018 from the 21st Century Cures Act relates to dissemination to payors information about medical products that are not yet cleared for use. The new rule from the ONC this February requires better data sharing with patients. Patients also share their data through their digital devices. The Apple Watch and others are all just conduits to data collection, Boone said, which can lead to issues of privacy and security. Stay tuned for Pharma Forum 2020. We don’t have the exact date, but it’s a go for HIMSS20 next year.